It comes but once a year and it is everybody's favorite season. The Christmas Poems Collection from the writers at My Word Wizard will set the mood right as you usher in this festive holiday in all its wonderment and joy. There are two aspects to the holiday. One is the deeply religious element that is central to the celebration throughout the world. Christians and non-Christians alike tune in to the traditional Yuletide services in Rome and Bethlehem. 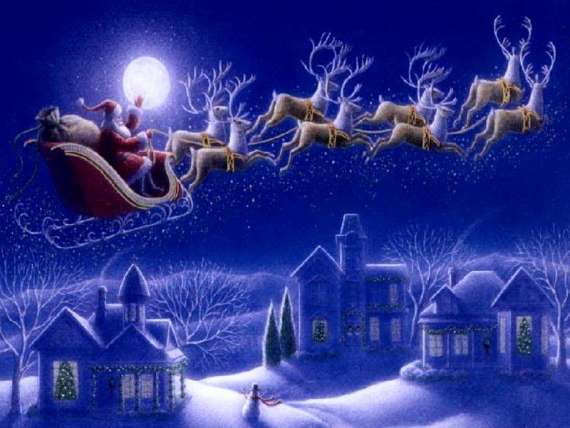 The other side of the holiday is more secular in nature, and includes all the well known symbols like Santa Clause or Father Christmas, Rudolph the Red Nosed Reindeer, and the ubiquitous Noël tree. You will delight in our sentiments that capture the true spirit of X-Mas. Words of family, eggnog, and inspirational thoughts will truly make this a time to remember. We think you will really enjoy this very special Christmas Poems collection. Cute X-Mas Poems : This wonderful holiday collection is sure to resonate with you as we enter the thick of the season. Whether it's the rush of shopping for presents, gathering with family around the fire, or the kids anticipating the arrival of 'ole St. Nick, here you will find the perfect sentiment to put you in a festive mood. Poems for X-Mas : The writers at My Word Wizard offer you a delightful selection of sentiments that reflect the true essence of the season. They will surely put you in a festive mood so you can spread some real holiday cheer. Religious Poems for Christmas : Many of our contributors submit poetry to that takes focuses on the religious aspect of Christmas. Through their words, they seek to imbue the holiday with meaning beyond the secular trappings sometime draw attention away from what the holiday is truly about. X-Mas Card Greeting Verses : Here you'll find wonderful sentiments to meet all your holiday greeting needs. If you are looking to give a Yuletide note to somebody special, or you need a verse to accompany a gift, the writers at My Word Wizard have crafted a thoughtful assemblage of words just for you. Yuletide Verses for Friends : One of the things that make the Yuletide season so special is the opportunity to share it with our closest friends. The writers at My Word Wizard have assembled a lovely collection of sentiments that pay homage to our friendships at holiday time. We are sure these reflections will resonate with you. Enjoy! Every single Christmas eve with my family I am leaving. I flew off to Poland but landed in Scotland and we went to Iceland.